A new poll conducted in Scotland shows that a significant majority of people in the British province would prefer to leave the United Kingdom if the country leaves the European Union without a deal. According to Press TV, the Panelbase survey, carried out for The Sunday Times Scotland and LBC, showed that almost three in five people, around 59 percent, would vote for independence if the UK fails to finalize a Brexit deal before it leaves the EU. Many expect the British Parliament to reject Prime Minister Theresa May’s Brexit deal on Tuesday. Both May and the EU have warned that the current deal, signed off by EU leaders last month, is the best and only option available. The UK government has reiterated that it will leave the EU March 29, 2019 whatsoever. That has caused serious concerns as a no-deal Brexit will leave trade and many other issues unregulated and would create huge uncertainty for Britain. However, a majority of the Scottish people surveyed, around 53 percent, said that independence from the UK would benefit the country more than staying in the UK outside the EU under a negotiated Brexit deal. More than 51 percent of the respondents, a total of 1,028 people, also said that they would back an early parliamentary election if May loses the Brexit vote in parliament. 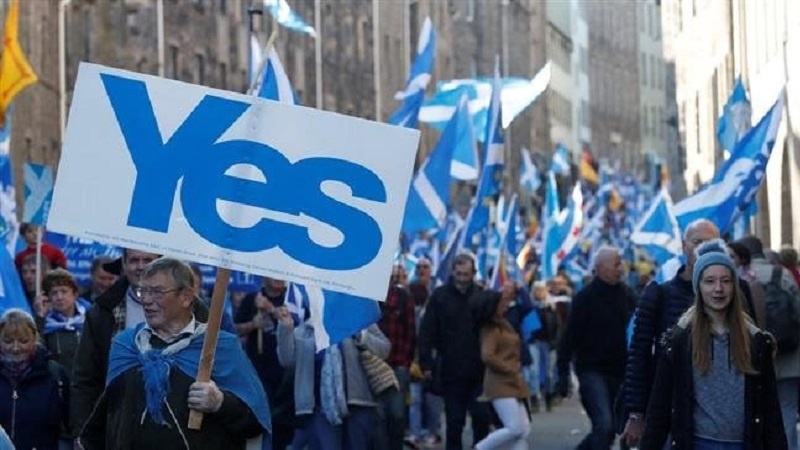 However, the poll showed that support for Scottish independence, regardless of what course Brexit takes in future, remained at 47 percent, a slight increase compared to the results of 2014 Scottish independence referendum in which around 55 percent voted against a separation from the UK.